In just a few weeks we will be heading to China! This will be the first time we have ever traveled to China, and also our very first time in having to obtain travel visas. Luckily we were successful in our first attempt at obtaining our China visas, but based on my research leading up to our application submission, it seems others have not been so lucky. While this post may be a bit dry, I hope this compilation of my research and experience will help other United States passport holders complete the application process smoothly and without delay, as multiple attempts can cost extra money that no one wants to spend. The application form and official instructions can be found on the website of the Embassy of the People’s Republic of China in the United States of America. It's official, we're going to China! 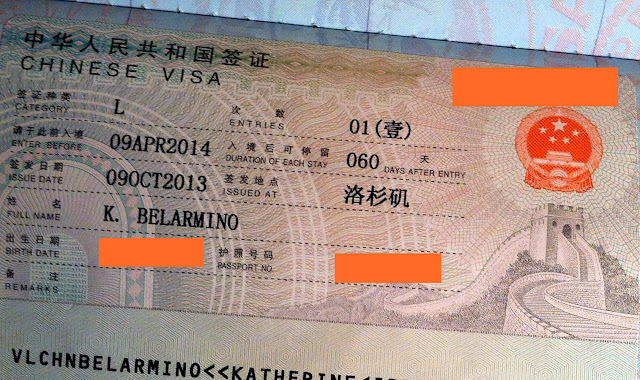 A new China visa application form came into use on September 1, 2013. It is a four page form which needs to be completed in its entirety. As of that date application forms can no longer be handwritten. Answers must be typed in all capital English letters and relevant boxes must be checked. The instructions state that if some of the items do not apply, to type N/A or NONE. However, I read of one person whose application was rejected in part because he typed NONE instead of N/A, so we used N/A. There are two ways to apply for a China visa. You can visit the Embassy which holds consular jurisdiction over where you reside. This will require two trips, the first to submit the application and supporting documents, and the second to pick up the visa and documents. The second way to apply for a visa is to use a visa service, which is what we did. It is not possible to apply for a China visa by mail. There are a number of documents that must be submitted along with your completed application: (1) your original passport which must be valid for at least six months and have at least one blank visa page (the three endorsement pages at the back cannot be used to fulfill this requirement), (2) a photocopy of the passport’s data page and photo page, (3) one passport photo taken within the last six months (no glasses can be worn) which should be attached with tape or other means to the application, (4) proof of residency (the embassy’s website states this is only for applicants applying in a country not of their citizenship, but the service we used requested either copies of our driver licenses or a copy of a non-phone utility bill), (5) photocopies of previous Chinese passports or visas, and (6) documents showing your China itinerary including roundtrip air ticket booking and proof of hotel reservation or invitation letter. In our case, since we booked a travel package with smarTours, we received an invitation letter along with our Air China reservation information. The tourist visa is the L visa. The standard tourist visa is a single entry visa valid for 90 days from the date of issue. Therefore, it is recommended to apply for your China visa no earlier than 50 days before departure. However, as you can see in the picture below, our visas are valid for six months from the date of issue, as decided by the embassy. There are other options including two entries valid three to six months from date of issue, multiple entries valid for six months from date of issue, and multiple entries valid for one year from date of issue. The application form itself is fairly self-explanatory. However, there were some items which I felt were not completely clear. Item 1.3 “Other Names” requires any maiden name or other aliases. Item 1.9 “Local ID/Citizenship number” is for your driver license number. 1.13 “Place of Issue” does not mean country of passport issue, but rather the authority, which in my case was US DEPT OF STATE. There are a number of choices for 1.15 “Current Occupation.” However, some of the choices apparently may cause complications. The best choices are businessperson, company employee (my choice), industrial/agricultural worker, self-employed (Romeo’s choice), or retired. For item 1.17 “Employer/School,” if you are retired or self-employed without a place of business, you can enter your home address. Item 1.23 requests major (immediate) family members. Romeo has one more immediate family member than spaces allowed, so we entered the additional family member at item 3.7. A separate paper can also be used. Item 2.6 “Itinerary in China” requests the addresses where you will be staying in chronological order and dates. List the first date at each address and the complete address, including the district if applicable. Entering Tibet or other similar locations may complicate the visa process. Item 2.8 “Information of Inviter in China” is the item that really threw me for a loop. We purchased our vacation package through smarTours, but according to the documents we received ground transportation in China will be provided by China Supreme Travel and our invitation letter was from China Supreme Travel. After calling our visa service company and smarTours, I decided to enter the information of China Supreme Travel. In the field for relationship with applicant I entered TOUR OPERATOR. Our Chinese Visas are safely in hand and we are ready to go! There are a number of visa service companies that will obtain your China visa for you. If you do not live near a Chinese embassy, this is the easiest option. I have read mixed reviews of many visa service companies, including the one we used. Many use Travisa. My first choice was actually China Visa Service Center. However, smarTours works with CIBTvisas and has reduced prices with them and since they are used to taking care of smarTours’ customers, I thought they might provide the best service. I was very happy with their service. I hated being without our passports. It’s very unnerving to not be in possession of your passport, even if you have no immediate out-of-country travel plans. What I loved about CIBTvisas is that they have an online tracking service so you can log on to their system at any time to see where your visa application is in the process. It gives a sense of control for a procedure over which you have no control. I sent all our documents to CIBTvisas via FedEx Priority Overnight. The next day I received an email letting me know they received the package. I logged on to their system the day after and found they had submitted everything to the embassy the day after receipt. They also listed the date they expected to receive our visas from the embassy, which was three business days later. Sure enough, our documents were picked up from the embassy on the expected date and shipped to us via FedEx that same day. The entire process, from my sending the package to having everything in my hands, took seven calendar days. CIBTvisas will charge a rush fee if you require your materials in 15 business days or less. The China consular fee is $140. CIBTvisas charges a service fee of $50 for smarTours customers, but their regular rate is $99, which is higher than the norm. There is also a 4.9% processing fee. The one thing I did not like about CIBTvisas is how much they charge for FedEx. They charge $44.10 to return your documents via FedEx Priority Overnight. This is at least twice as much as it actually costs. With the application package they also provided a FedEx shipping label to ship our documents to them, for which they would have charged $34.50. I shipped the documents using my own account, and the cost was less than $22. But being able to check the status at any time and the fact that the process was so smooth and quick was priceless. Thankfully we now have visas in hand and will soon be flying to China and spending time in Beijing and Shanghai, and I will be sharing our adventures with you here on the blog when we return.